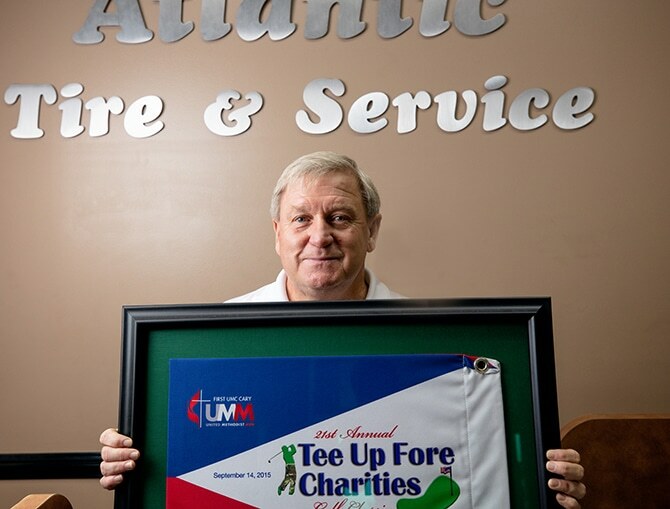 Anthony Blackman, owner of Atlantic Tire & Service was profiled in Walter Magazine! Anthony Blackman is a testament to the power of saying yes. He grew up in Sanford, North Carolina, and attended N.C. State University as the first college attendee in his family. He started his own business from the ground up, and gives to more charities than he can count. Blackman is always seeking connection in a world that tends toward isolation.And he’s not about to slow down now. 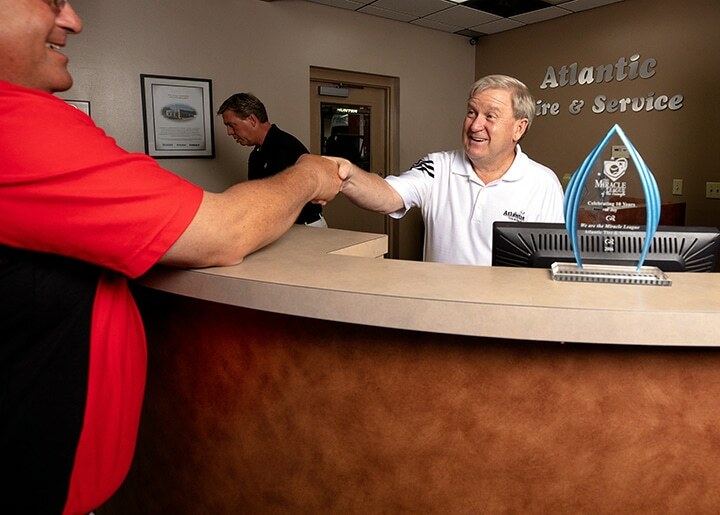 Blackman owns Atlantic Tire & Service, a local car care chain that opened its fourth location this year. The new store in Wake Forest joined the existing stores in Cary, Raleigh, and Research Triangle Park. And he has plans in place to open the fifth and sixth locations over the next couple of years. Blackman doesn’t operate out of a corporate headquarters somewhere. He has a modest office right off the lobby at Atlantic’s Cary location, and he’s as likely to be out of the office as in it, talking to customers or employees. He’s on a crusade to make people feel better about dealing with auto mechanics, focusing on customer satisfaction above all else. That same attitude extends beyond the business for Blackman and his wife, Beth. Blackman says he made charitable donations to 44 organizations last year, and a story several years ago in the Triangle Business Journal estimated that Blackman donated roughly 11 percent of his revenue to local nonprofits and community organizations. The reasons he does it are myriad and go beyond simply writing checks. The Blackmans have served in leadership roles for charitable organizations and civic groups, and Blackman has served as chairman of both the Cary and Morrisville chambers of commerce. It goes back to the way he was raised. That inspiration sat on a foundation built by his parents, however. His father worked at a textile mill in Sanford, and his mother raised four children. He remembers his first job, as a paperboy delivering The Sanford Herald. On a snowy day, he decided to skip one of the steeper streets on his route, figuring no one would know the difference. By the time he got home, one of his customers had already called to ask where his paper was, and his mother was waiting for him. “I learned right then and there: You deliver on your promises,” says Blackman. And that was a two-way street. As determined as his parents were to make sure he made all his deliveries each day, they also impressed upon him how important it was to collect his money each week. His mother’s influence truly shines through in Blackman’s dedication to service, however. He recalls the death of his grandfather when he was young. The family was using a local funeral home to handle the arrangements, and went with their housekeeper, who was African-American, to pay their respects. Someone stopped them and said, “We don’t allow coloreds in the funeral home.” Blackman’s mother did not raise a fuss. She acknowledged the policy and simply said, “We’re taking our granddaddy out of here.” They took their business to another funeral home and never returned. Blackman says he didn’t fully understand what was happening at the time, but he did get the message that if you wanted the world to be a better place, you had to take an active role in making it that way. “That sense was instilled in me at a very early age,” he says. You see the evidence of his work all over his office. Awards or other tokens of appreciation from the Miracle League, a local nonprofit that provides the opportunity to play baseball for children with special needs; the Carying Place, a group in Cary that provides transitional housing for homeless families; the Boy Scouts, the USO, the Rotary Club, the Salvation Army. It’s obvious that Blackman thrives on human connection, and values giving more than receiving. The Carying Place clearly has a special place in Blackman’s heart, not only because it has an intensely local focus, but because it is about helping people through a direct relationship, and giving them the skills to become stable and self-sufficient. He talks about not throwing money at problems, about actually getting out and helping people, and The Carying Place seems to check all of those boxes. Leslie Covington, executive director of The Carying Place, says the Blackmans have helped the organization through everything from donations and event sponsorships to leadership on their board. Don’t get the idea that business is just a sideline to Blackman, though. Building a thriving business is what has allowed everything else to follow. Even if Blackman doesn’t call himself a people person, you could make that determination for yourself. When talking to him, you’re bombarded with the names of the various people he has crossed paths with through the years, from the rich and powerful to the poor and humble. After 10 years, Blackman wanted to expand the business westward, and Leicht wanted to get his family involved, so they parted amicably. Leicht retained the original business, which he continues to operate in its original location on Harrod Street right off Atlantic Avenue. Blackman opened a standalone location in Cary, simply dropping the “Avenue” from the business name. He says he will never forget a young neighborhood child named Tommy Lee Morgan who came into the store asking about one of the bikes on display. Blackman let him borrow it, and they developed a long-term relationship. As the boy grew up, Blackman helped him financially and counseled him. Morgan died at a young age from drug use. Those plans are still a few years off, but the vision is there. As is the case with most of Blackman’s pursuits, he hasn’t even contemplated the possibility that it won’t be successful. He can already see the building, inside and out.